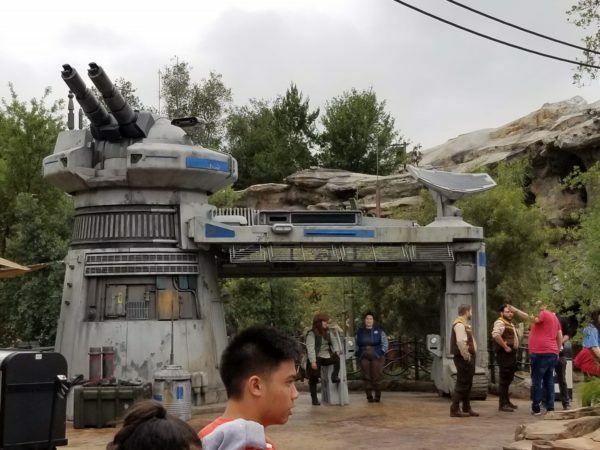 Visitors to Disneyland's Galaxy's Edge can expect to see megablaster cannons in gift shops, laser weapons stowed in ride queues and stormtroopers with rifles at the ready, but there's one thing they won't be able to buy in the new Star Wars land: guns. Star Wars: Galaxy's Edge won't sell blasters, rifles or pistols, Disneyland officials said. Weapons are not permitted in Disneyland, including toy guns and toy blasters. The new 14-acre Star Wars: Galaxy's Edge at Disneyland will be set in the Black Spire Outpost village on the Star Wars planet of Batuu amid rising tensions between the good guy Resistance and the bad guy First Order, according to the backstory created for the land. The challenge for Walt Disney Imagineering, the creative arm of the company, will be to tell an authentic and immersive story about conflict in a war-torn village while accounting for visitor safety and adhering to the park's ban on toy weapon sales. The Star Wars themed land will be filled with docked starfighter ships, Resistance gun turrets and armed First Order stormtroopers on patrol. The ride queue for the Rise of the Resistance attraction in the new land will take visitors through tunnels carved by an ancient civilization. Along the way, visitors will pass through an armory where Resistance rebels store laser weapons and munitions in locked cages. Imagineering concept art of the First Order Cargo gift shop in Black Spire Outpost shows F-11D blaster rifles on the shelves, FWMB-10 megablaster cannons prominently on display and a stormtrooper armed with a rifle near the entrance to the store. Disneyland officials said the concept art is conceptual and may not represent what visitors will see in First Order Cargo. There will be one notable exception to Disneyland's toy weapons ban policy: lightsabers.